Belmopan police are presently attempting to unravel the circumstances surrounding the shocking death of the Charge d’ Affaires of the Panamanian Embassy in Belize whose lifeless body was reportedly found, with cut wounds to the neck and head, at about 4:00 p.m. yesterday, November 23, in the western part of Belize’s capital, Belmopan. 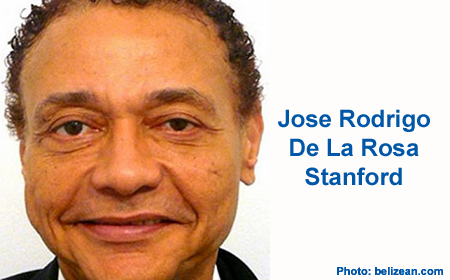 Today, police reported that the mutilated body of Jose Rodrigo De La Rosa Stanford, 64, was discovered about ¾ mile from the La Chosa area, and sometime this evening, his vehicle, a white Nissan with diplomatic license plates, which had been stolen, was recovered by police. While authorities have launched an investigation into the apparent homicide, details of the events leading up to the grisly death of De La Rosa Stanford remain unknown, and while we have confirmed that an associate of De La Rosa is currently detained and being interrogated by police, it is still unclear whether was De La Rosa killed in the area where his body was found, or if he was killed elsewhere and his body left in the area near La Chosa, where it was found by police on Sunday evening. La Chosa is a recreational area, bar and restaurant located west of Belmopan, and is popular with local residents and expatriates. Unconfirmed reports reaching Amandala are that the Panamanian diplomat left his home at around 9:00 on Sunday morning, seven hours before he was found at around 4:00 p.m. that same day. Amandala understands that the Government of Panama has confirmed the murder of the diplomat in Belize and consequently issued a press release today, which was published in Panamanian newspapers. “De La Rosa was a career diplomat and served as Chargé d’ Affaires at the Embassy of Panama in Belize. The President of the Republic [of Panama] has made available the presidential plane so the family of the diplomat can travel to Belize and return his body to Panama as soon as possible”, it went on to state. Belize’s Ministry of Foreign Affairs has informed us that they will issue an official press release on the unfortunate incident after the autopsy has been performed.